If you were trying to get your Pasmo or Suica card to help you get around a little bit more easily in Japan, I hope tutorial articles were easy enough to follow, and I hope you have your new Pasmo or Suica Card in hand. Now that you have it, what exactly can you do with it? How exactly do you use a Pasmo card? 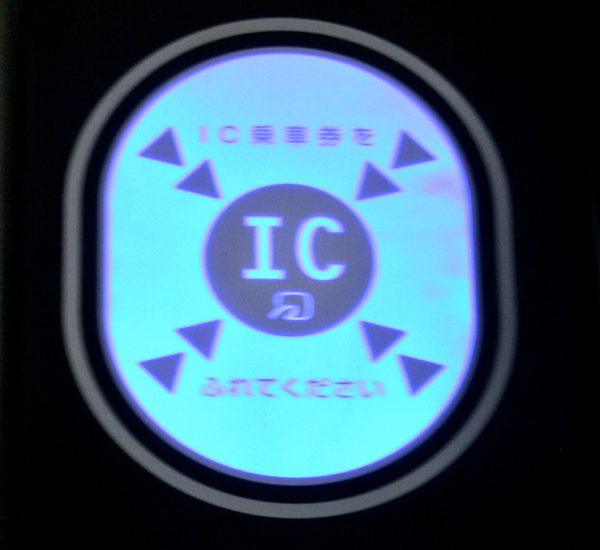 How do you use a Suica card. Pasmos and Suicas follow the exact same guidelines so we’ll just look at one type of card as an example. 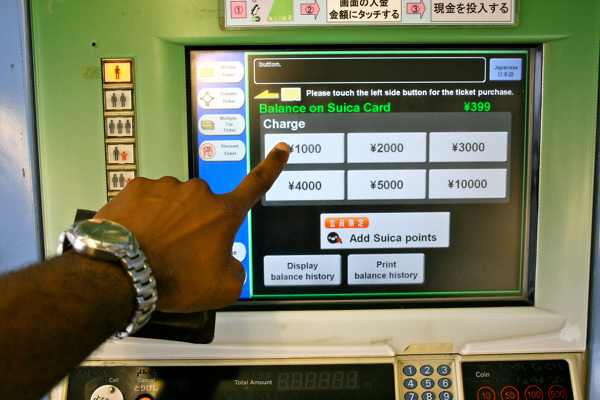 Let’s examine four aspects of using your Suica or Pasmo card: 1) charging your card, 2) using your card to ride the train, 3) making purchases with your Suica, and 4) checking your balance. 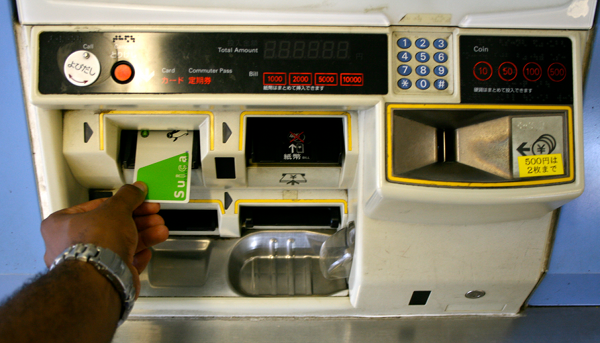 Remember the machine that you purchased your Pasmo or Suica from in the previous tutorials? You’ll use the same one to add value to your card. Touch the charge button in the lower left panel. Step 2. Select the amount you want to add. I’m pretty sure that 1000 yen is the minimum amount of value you can buy. Step 3. Touch the receipt button if you need one, then insert your cash. Touch the receipt button if you need one (see video) and insert cash. Step 4. 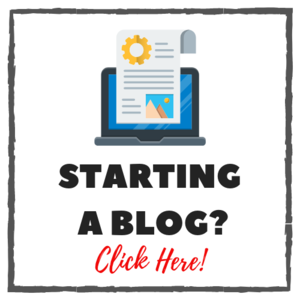 Take your newly charged card! 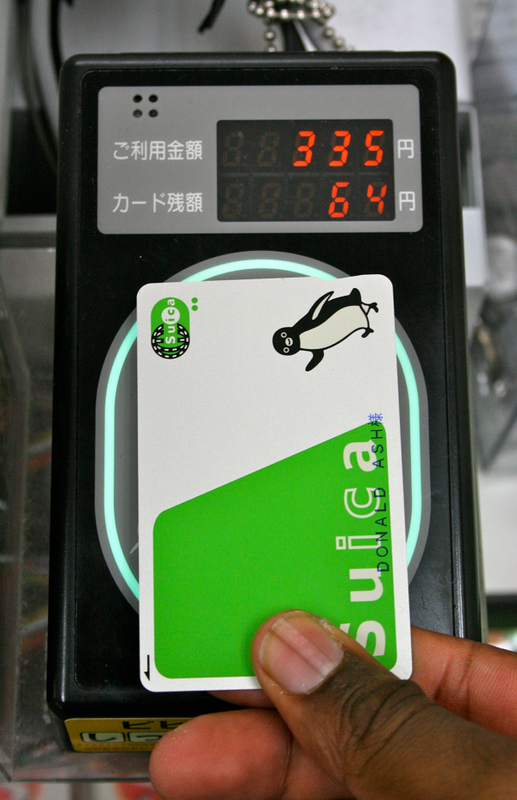 Take your newly charged Suica or Pasmo card! 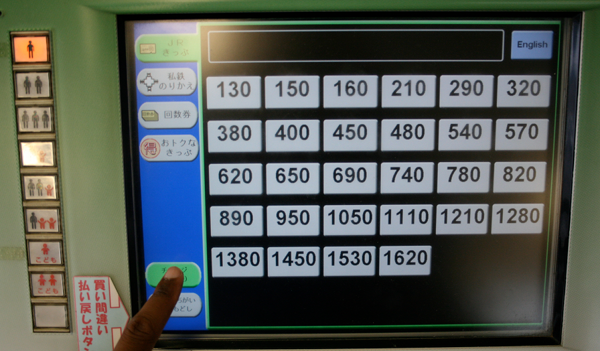 This is the main function of your Pasmo or Suica care, and probably the easiest to use. 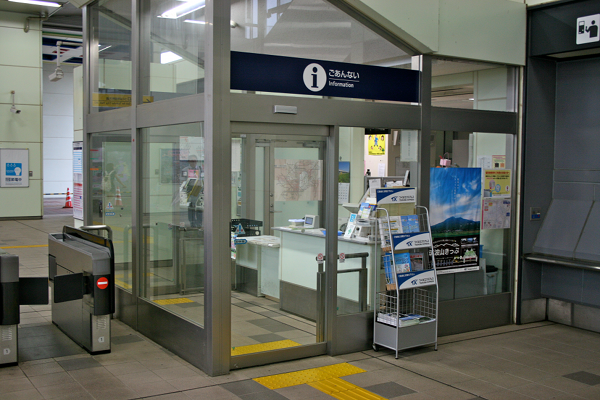 To use your card at a train station, simply touch your card to the IC reader on the ticket gate panel, and the gate doors will open. If you hear a simple beep, and see the blue light blink, you’ve done it correctly. If you hear “bing bong,” and the IC reader turns red, it meant you probably don’t have enough value left on your card. Don’t panic if this happens, it’s an easy fix. Simply walk over to a fare adjustment machine (all of the train stations will have them somewhere near the ticket gates), insert your card, pay the difference, touch your card to the panel once more and go through. Oh no! Insufficient funds! Just head over to the fare adjustment machine for a quick, easy fix. ALRIGHT! It worked! It's blue! *Note: The IC chip in your card is pretty strong, I don’t even have to take my cart out of my wallet. 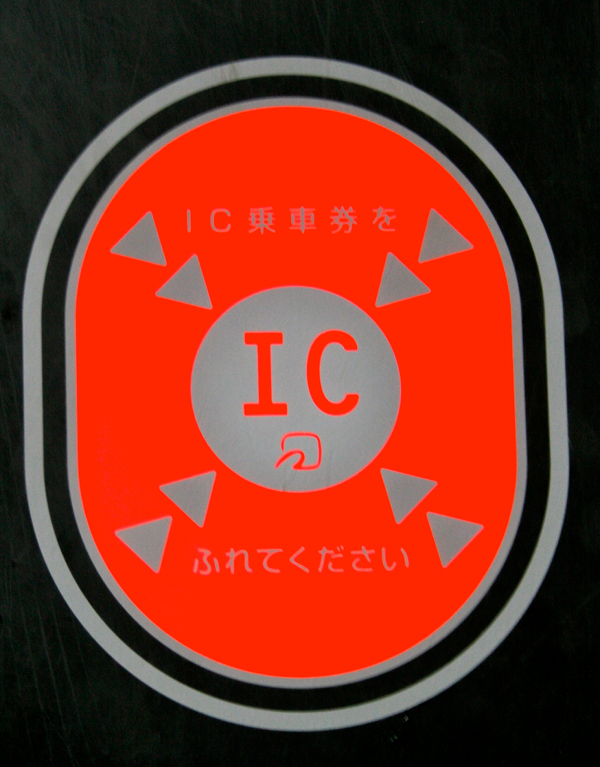 I simply touch my wallet to the IC chip and I’m able to go through. 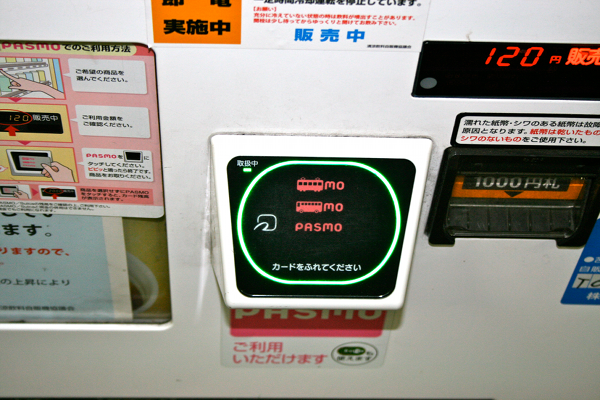 Many vending machines, convenience stores, and shops in general will allow you to use your PASMO or Suica cards. 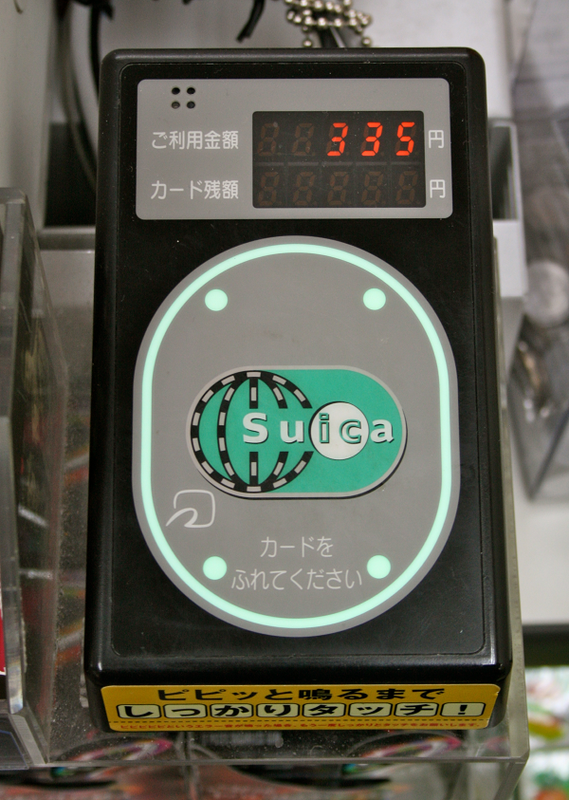 In general, a great way to find if a store will use your Suica is either to ask the clerk, or (more discreetly) see if there is a PASMO/SUICA scanner at the checkout counter. 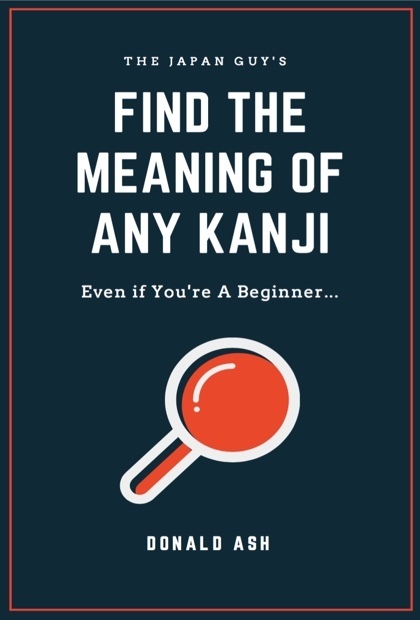 1) Train Station Information Booth: Go to the information booth and just say “Sumimasen, balansu wa nan desu ka?” “すみません、バランスはなんですか?” like you’re asking a question. This place is a life-saver, they don't speak much English, though. 2) Vending machine: This is probably the simplest way to go. If there’s a vending machine, you can touch your card to the sensor, and it will tell you just how much you have. If you don’t have enough, just wait, the sensor will reset on it’s own, not charging your anything. 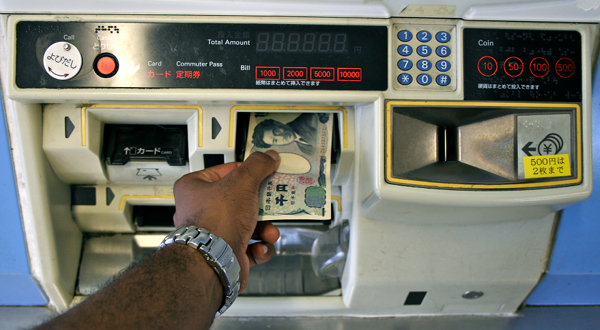 3) At the store you’re shopping at: Ask that magic question again, “Sumimasen, balansu wa nan desu ka?” and they’ll let your touch your card to the sensor, showing your account balance. Convenience store reader showing your balance and the amount charged. When you touch your card to the ticket gate, the rectangular display farthest from you will show two numbers: the top number is your balance and the bottom is how much the current trip cost you. Charge machines, will display how much money is on your card before you insert any money, and fare machines will do the same. The charge machine is better to use because usually people at the fare machines are in a bit of a rush. **I also want to say I heard about a special feature with Docomo (one of the larger cell phone companies in Japan) cell phones, or was it au?, that links your card to your cell phone. You can check your balance and all that stuff, but don’t quote me, I’m still learning about the cell-phone PASMO/SUICA card link. Just in case any of the pictures or instructions managed to confuse you, the video should simplify things for you. ENJOY!! As both cards also have nearly the exact same two main functions, 1) riding the train more efficiently and 2) making purchases, they are both pretty straightforward once you get the hang of them. If you have any questions, let me know 🙂 and I’ll do my best to help. P.S.-Other lesser-known potential uses for a Suica or Pasmo might include the following: a shuriken, an eye patch, a pharmaceutical grade “powder refiner” (nothing illegal…I’m talking like protein and stuff), a makeshift spoon, a makeshift knife, a bookmark, a shaver, a bullet repellent (DO NOT actually try that, you may be dreadfully disappointed. Can American Cartoons Compare to Japanese Anime?